In this week’s episode, I’m talking with Elisheva Schwartz, a dyslexia researcher, mother, wife, intelligence re-definer, and host of The Dyslexia Quest podcast. Elisheva is on a mission to empower the dyslexic community to fully understand both the strengths and the difficulties of the processing style. 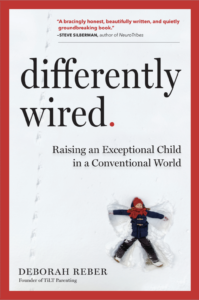 If you have a child with learning differences like dyslexia, this is a must-listen-to episode, as Elisheva gets personal and shares her story of her own childhood of struggling to reconcile her passion for learning with repeatedly being told she was learning disabled. Luckily for the rest of us, Elisheva has channeled the pain of her own childhood journey to helping families raising kids with learning differences help their kids feel empowered and confident about who they are, while also knowing how to advocate for them in school. I hope you enjoy our conversation. About Elisheva: Elisheva Schwartz is a dyslexia researcher, mother, wife, intelligence re-definer, and podcast host. She’s on a mission to decode the dyslexic mind and empower the dyslexic community to fully understand both the strengths and the difficulties of the processing style. Both her academic background in Cognitive Science and Education, as well as her own personal experiences with dyslexia, allows Elisheva to draw on a unique blend of both the personal and scientific. Elisheva often writes about dyslexia, cognition, learning, creativity and intelligence, and maintains an occasional column at The Creativity Post. Additionally, Elisheva often speaks at universities and conferences, with some of her latest speaking engagement including The International Dyslexia Association (Panel) and University of Philadelphia. Learn more about Elisheva here.